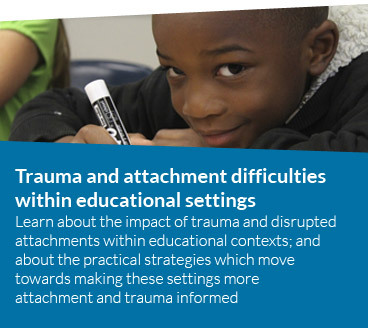 This page is focused on providing resources, websites, information, & services around moving towards and sustaining being a culturally, adversity, and trauma-informed, infused, and responsive organisation and system. We at Safe Hands and Thinking Minds also offer a range of consultation, support, and training packages to support and enhance this transformation. A adversity, culturally, dissociation, and trauma-informed organisational lens acknowledges & advocates that “trauma-informed” practice is so much more than a buzz word, a one-off training event, a fruit bowl being placed in a reception area, an adapted policy collecting dust on a shelf, or a tick-box exercise. It is more about meaningful multi-layered whole-system wide change. This focuses on supporting, creating, embedding, & sustaining cultural & paradigm shifts & transformation across all levels of the organisation. This shift & vision recognises the prevalence, & multi-layered impact of trauma & adversity at an individual, family, societal, & organisational level; as well as the crucial parallel processes which can occur within & between these systems. 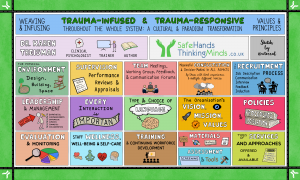 Therefore, culturally, adversity, and trauma-informed and responsive organisational transformation focuses on humanising systems & making them healthier, more relational, more integrated, more reflective, & more connected. It is about changing how systems do what they do, & who they are- their very fabric. This also includes embodying & infusing adversity, culturally, dissociation, and trauma-informed ideas & practices into everyday practice, into the feeling of the place, & into the whole system; from policies to supervision, to team meetings to the language used, to recruitment procedures, to the physical environment, & so forth (Please see the infusing & weaving worksheet below). Under a trauma-informed process, this knowledge, values, principles, & assumptions aim to be embedded into the culture of the organisation, & are ideally owned & contributed to by everyone; including those from multiple levels, roles, & those with lived experiences. 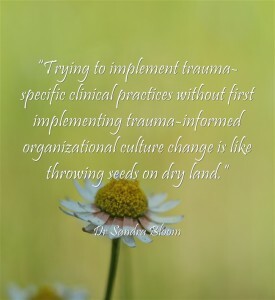 A trauma-informed process can not be trauma-informed without being interconnected with areas of cultural humility, cultural inclusiveness, & cultural responsiveness; including integrating & acknowledging historical trauma, oppression, cultural trauma, social injustice, intersections of identity, & inter generational trauma. Within trauma-informed organisational change there are various steps, guiding values, & stages; however, like with people, this can be slow, complex, not linear, & messy. Therefore, the progress, development, embedding, & sustaining of meaningful trauma-informed ideas, attitudes, policies, & practice is an ongoing process & a journey. To engage more with these ideas. Please see worksheets & websites for more information & resources. Dr Treisman & associates passionately believe in social, contextual, societal, & systemic impact & that trauma-informed practice is a social movement. 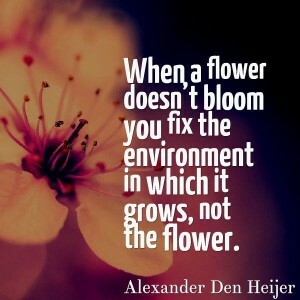 As the quote above says, “If the flower doesn’t bloom, you don’t try to fix the flower, and you certainly don’t blame the flower, but you try to make environments which support flowers to bloom”. 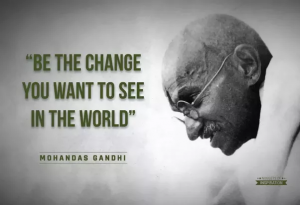 Therefore, we need to make adversity, culturally, and trauma-informed, infused, & responsive environments which not only acknowledge, respect, & are structured around the pervasive, extensive, & multi-layered impact of trauma, dissociation, toxic stress, and adversity in our societies; but also ones which actively resist & reduce further re-traumatising, blaming, marginalising, exclusion, & oppression. Dr Treisman & associates have also experienced the vast difference, impact, & physical/social/spiritual/emotional consequences of working in traumatised, trauma-inducing, and unhealthy systems; verse working in connected, supportive, healing, & nurturing teams. This has further validated & fuelled their passion & dedication to trauma-informed organisational practice. To develop further, connect, & expand on these ideas & passion, Dr Treisman was also awarded a Winston Churchill Fellowship which involved travelling to 13 cities across America, attending 3 international conferences, & having meetings with over 100 specialists in this area to learn from best practice in culturally, adversity, dissociation, and trauma-informed, infused, & responsive systems. The report from this trip will be added here shortly. Dr Treisman wishes to extend a huge thank you to the incredible people & organisations who gave their time, energy, & knowledge to the trip; as well as to the Winston Churchill Fellowship for a phenomenal opportunity. 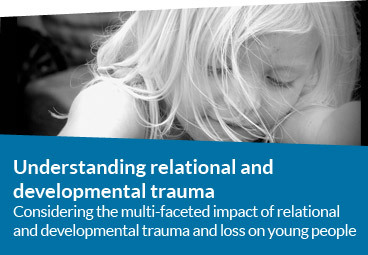 Therefore, to disseminate these ideas, & expand on them, Dr Treisman & associates have drawn on their extensive clinical experience in the areas of relational trauma, developmental trauma, disrupted attachment, trauma-informed organisational change, refugee & asylum-seeking people; as well as in the areas of implementation science & groups dynamics to offer a range of support, consultation, & training packages; & to create multiple free trauma-informed organisational resources & useful links (See below). 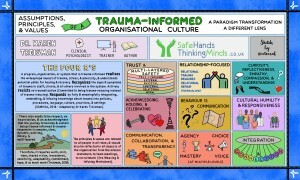 They are also currently proactively putting these theories, concepts, models, values, & ideas into practice by offering trauma-informed & trauma- responsive transformation packages (of different lengths and levels) to multiple organisations within the UK & internationally (Africa & Asia) including residential homes, social services, foster care systems, prisons, youth offending services, schools, hospitals, homelessness shelters, & domestic violence shelters. Please contact us to learn more about the fellowship, the worksheets, training, consultancy, and support offered around meaningful trauma-informed practice.